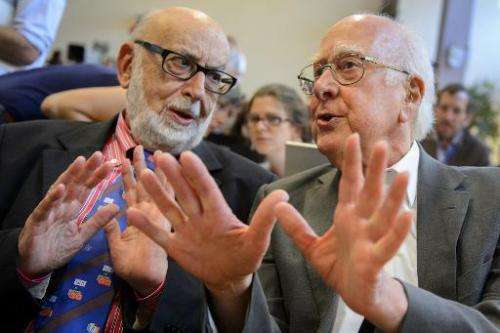 British scientist Peter Higgs said he was "overwhelmed" after he and Belgium's Francois Englert were jointly awarded the Nobel Prize in Physics on Tuesday for their work on the Higgs Boson particle. "I am overwhelmed to receive this award and thank the Royal Swedish Academy," Higgs, 84, said in a statement released by Edinburgh University, where he is emeritus professor of theoretical physics. The Nobel jury said they were honoured for "the theoretical discovery of a mechanism that contributes to our understanding of the origin of mass of subatomic particles, and which recently was confirmed through the discovery of the predicted fundamental particle". The elusive boson was theorised by Higgs in 1964 when he was a young lecturer in Edinburgh, outlining what gave mass to matter as the Universe cooled after the Big Bang. The principal of Edinburgh University, Professor Timothy O'Shea, said the institution was "delighted" and he paid tribute to Higgs' research. He said: "The discovery of the Higgs particle will underpin the next generation of physics research, and this accolade is worthy recognition of its significance. "Professor Higgs' work will continue to inspire scientists at Edinburgh and beyond." Higgs is an honorary fellow of the London-based Institute of Physics. Its president Doctor Frances Saunders said Higgs' work had cleared the way for the world of physics to move on to understanding dark matter and quantum gravity. "The work undertaken to discover the Higgs—from the original theories to the construction of the world's most powerful particle-smasher—has led to a very exciting and productive period in physics research," he said. "It has been a long journey but one that has inspired a generation to engage with the subject. "With the existence of the Higgs Boson confirmed, explaining why the fundamental building blocks of nature acquire mass, we can now move on to the next challenges to our understanding such as the phenomena of dark matter and quantum gravity."